First row, from left: Andy Velez, independent sales account executive at APH; Kim Heinecke, Annandale Auto Care; and Scott Heinecke, Annandale Auto Care. Second row: Rich Violette, sales director of key accounts at SMP; Dan Ledwein, Annandale Auto Value; and Corey Bartlett, president and CEO of APH. Third row: Doug Froehlich, territory sales manager at SMP; John Bartlett, executive chairman of APH; and Dave Bock, independent sales manager at APH. Auto Value celebrated the end of its Aftermarket Jackpot Jumpstart Sweepstakes, powered by Standard Motor Products, by announcing the $10,000 grand prize winners. Scott and Kim Heinecke, of Annandale Auto Care, were one of six grand prize winners. The Heineckes claimed their prize during Auto Value’s 88th Annual Product Expo Show in St. Cloud, Minnesota. The Heineckes have owned and operated Annandale Auto Care since 2004. The service center offers a number of automotive repairs and services, as well as tires, to area residents and businesses. During the months of January and February, professional technicians received an entry into the Aftermarket Jackpot Jumpstart Sweepstakes with each Standard Motors Product purchased through MyPlace4Parts. 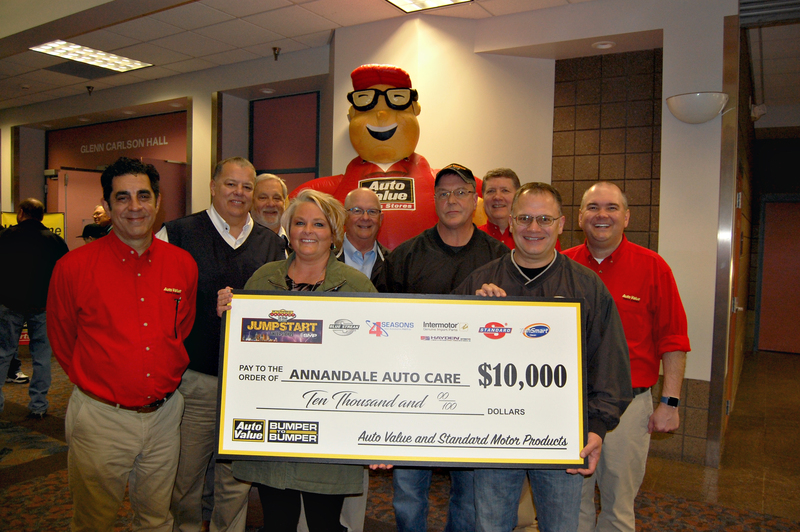 Annandale Auto Care was drawn from more than 63,000 entries. For more information and complete list of winners, please visit www.JackpotJumpstartSweepstakes.com.